But the Ahr valley is much closer, much smaller and in particular much narrow. While winter it can become cold and there is even snow sometimes and certainly sometimes pretty deep temperature. Already during spring but certainly while summer and autumns the very stony soil can contain the warmness and even heat of the sun very long. If you sit on a sunny side of such precipitous steeps you can easily take a sunbath. During night the coldness of the rivers climbs up along the hills and everything cools down during night tremendously. In my point – and of course many experts might complain about this statement – this valley delivers the best German red-wine which has a lot of individual characters. Some of the most famous vineries of Germany are form there as Adeneuer, Deutzerhof, Jean Stodden, Meyer Näkel and last but not least Nelles. All of them are similar in regard of the origin, but in certain regards very different in regard to their product – all of them make top wines although every wine has really its own character. The vinery Nelles comes from Heimersheim, which is the last village of the valley before Ahr ends into the Rhein. This said, there are of course differences even within this valley in respect of soil, sun and other aspect of the location of the vinery. And, every winemakers has different priorities in regard to what happens in the cellar. The Nelles family is –understandable – very proud that they have documents which shall proof a first notice of their vinery already in 1479 which indeed is remarkable long ago. Of course historical tradition of winemaking can be an important reference (independently of the country of origin: https://avdwineandfood.wordpress.com/2015/04/26/rosso-batic-reserva-1999/), I wouldn’t give so much about it as it always depends to the actual living winemaker, but it’s a marketing thing! 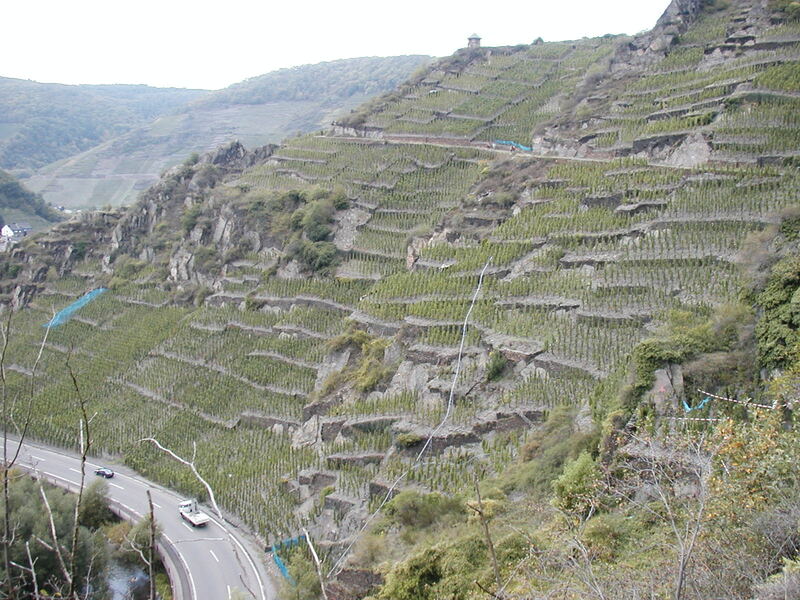 Let’s assume there is probably winemaking in Ahr valley for so much longer time than we would ever be able to account. The main person behind Nelles is Thomas Nelles, but his son Philip overtakes more and more responsibility. 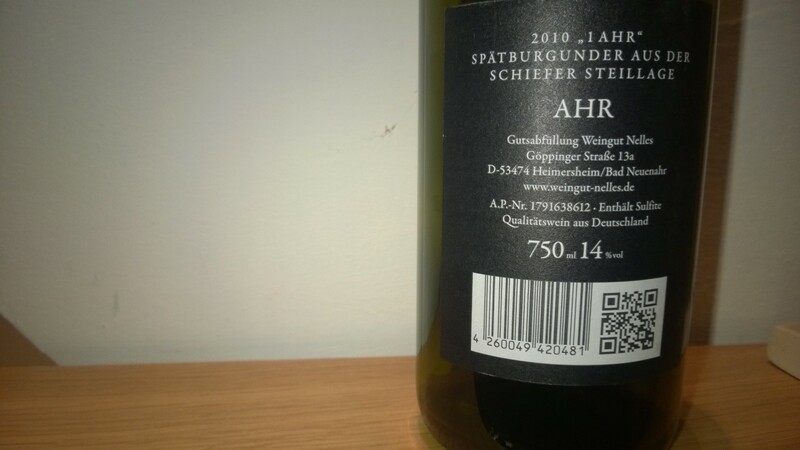 He created a new Spätburgunder called “1 Ahr”. This is not the most top wine of them but very close below that what we call in Germany “Grosses Gewächs” – Grand Cru. Grapes of this wine were growing in vineyards which are qualified for “Grosse Gewächs” wines. As a statement of emancipation but at the same time expression of respect to his father he formed this excellent and characterful wine. I still like to say that this wine is a typical “Ahr” Spätburgunder although is a bit more smoother and softer. Generally this is so prototypal Ahr: rich of character, quaffable in a positive meaning, enlarged by excellent work in the cellar and as all the wines of Nelles in general this once cares a lot of different wooden or oaky tastings. The wine is really powerful – not only by alcohol (14% !) – but also by its balance and cool finesse which comes from the soil. The wine is really fresh, fruitiness of cassis, cherries and cranberries. But there is also pepper and even some elements of chili connected with some sweet memories of bitter chocolate pralines. Barrique is very present as just mentioned and of course this is rather in purpose as their barrels are used many times. For some moments this wine could be compared rather with some American Pinot Noir but as much it is richly complex it still keeps its Northern character. The color of the wine is a transparent ruby red; the aromas of wine are catchable by a first nose. Perhaps the only dilemma is that the wine has a grade of alcohol on a level of 14% as you don’t taste it. The lights fruity sweetness of the last drop of a wine bottle hides this very well. Food wise I would say this is one of the only red-wines I would consider for selected – red meat – Asian meals but of course also for any style of marinated beef as the famous “Sauerbraten”. Last but not least I like to say: this is a great and beautiful label! If you need more information just visit the webpage of Nelles: http://www.weingut-nelles.de/.